As long as there’ll be music, we’ll be comin’ back again. It’s like I can hear the Heavens singing. I have been waiting for this day…well, since they left. They never really left me, though. I have always been a boy band fan. At any time on any given day you will hear them playing in my car, and from my laptop/phone. There is just something about them that makes me love them. Their characteristic good looks and charm, their non-threatening personas, and of course those uber sweet and fun songs. My love affair with boy bands began at a young age. My first musical love in life was Hanson (don’t judge), but if you really want to get technical, I guess it began with The Beatles. The Beatles were/are my dad’s favorite group, so when I was little they were mine. But the first group that I really remember being devoted to was Hanson. That devotion never really faded. I still love them just as much, if not more than I did back in the day. I’m always going to be slightly bitter that they all married other girls, but whatever (Seriously, they may have looked like girls wen they were younger, but look at the handsome men they became). Now it’s one of those deep loves, you know like that one quote I see every where “….love is like a flame…blah, blah, blah…grows deep as embers…” (something like that). Now I truly appreciate their music. There will never be another Hanson in my life. Then there was the wave of boy bands in the mid to late 90s. I loved them all. I mean, back then you had to choose a team, you COULD NOT like both Backstreet Boys and *NSYNC, so I was Team *NSYNC (though I secretly loved BSB, too). I was fairly convinced that I was going to marry Justin Timberlake (I was overlooking the strange 8 year age difference, I would still marry him if he’d get rid of Jessica Biel). I was crazy obsessed with them. Anyone who knew me back in the day can attest to this. I owned every single thing they made; posters covered my walls; I had a t-shirt for every day in the month. It.was.bad. (I may o may not still break out in to dance every time “Bye Bye Bye” comes on.) Luckily I got to see them in concert once (PopOddessy Tour. Arrowhead Stadium. July 10, 2001) before they disbanded. And, let me just be honest here, there is no limit on the amount of money I would pay to see them again if they were to ever go on a reunion tour. I would sell one of my kidneys, and perhaps a lung, too (that’s not a joke). Then along came the Jonas Brothers. Once again, I was obsessed. I can distinctly remember when/how it started. It was my 18th birthday, and my mom had bought me (ironically enough) Hanson’s latest album, The Walk, but the Jonas Brothers had just released their self-titled album, Jonas Brothers (duh). Though I was, of course, pleased to get Hanson’s new album, I went out and brought the JoBros album. And then in February, Tara and I went and saw their When You Look Me In The Eyes tour. And the rest is sort of history. I was crazy obsessed. Like, one of those fangirls, only less annoying and potentially more scary for them because I was smart. I’ve seen them a total of three times (four if you count the time I saw Nick’s solo tour). Once even I drove all the way to Omaha, Nebraska to see them. I’m still a fan. I bought Nick and Joe’s solo albums (I liked Nick’s a lot more than Joe’s), and I am anxiously awaiting all the new music they’ve been working on. Oh, and I still stalk their whereabouts pretty much daily. (Unfortunately every time I come to California they go to NYC. And now that I moved here, they all live in NYC. I’m still pretty bitter about that.) I’m still not totally convinced I won’t marry one of them (obviously Joe or Nick, because Kevin is already married, and Frankie is too young). And now there is a new way of boy bands. One Direction. Big Time Rush. The Wanted. (There are probably others that I’m forgetting.) I’ve always kind of loved Big Time Rush. I liked to watch their show when I was home. It was silly and fun. Their music is classic boy band, and they all happen to have the boy band look. Handsome and clean cut. I’m actually currently campaning to work on their up coming summer tour (so if you happen to know anyone who works for Columbia Records, hit me up), because I think it would be fun. Four crazy guys who have to entertain 13-year-olds for 1.5 hours? Tell me that doesn’t sound like fun. I only vaguely know The Wanted. I’ve heard their one song “Glad You Came,” but that’s about as far a I go in knowledge of them. I wouldn’t be able to pick them out in a police line up. Then there is One Direction. I hated them for so long. I remember reading about them months ago. Months before they blew up over here. And I hated them. I had never actually heard any of their songs, but I hated their public personas. They are dirty, inappropriate and I was just not a fan. I’m still not sure that I am a fan. But, I did buy their album. Because I couldn’t resist. As I have just laid out my musical history with boy bands, you can see that it is embedded in my DNA to love them. And as much as I want to hate One Direction, their music is classic boy band. It’s fun, incredibly catchy and sweet. I just want to make it clear that I do not like them, I just like their music (which was not written by them). MTV has created a competition that was made for me. 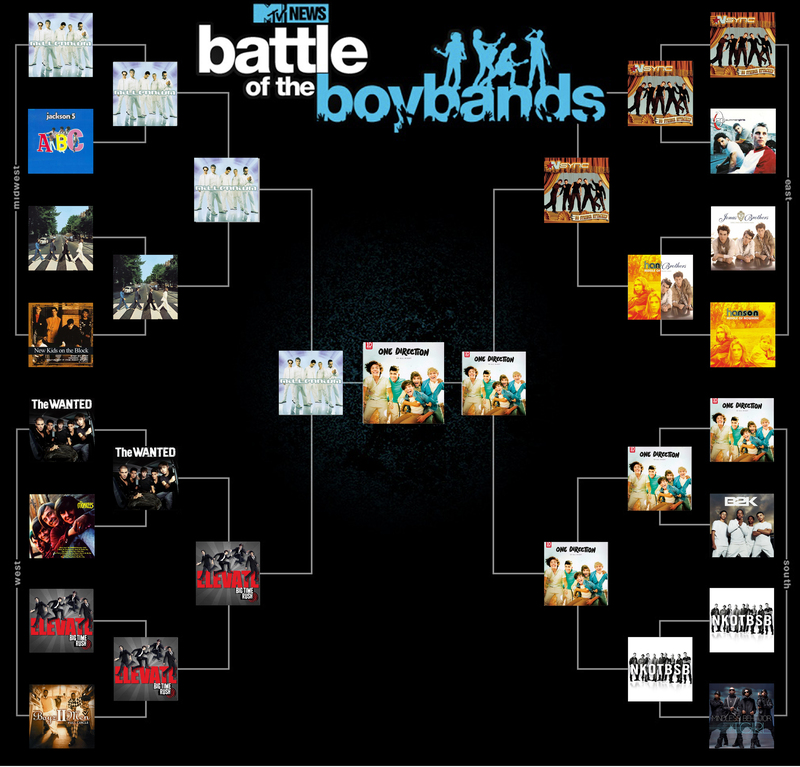 Battle of the Boy Bands. Voting began yesterday on this bracket (which as far I’m concerned trumps the March Madness bracket by a landslide). The starting 32 boy bands. I decided to take some time and give you my picks. Below you will find two separate brackets. The first one is what I anticipate happening, And the second one is what I want to happen. This what I predict will happen. Now, as I just explained before, I do not love One Direction…but a lot of girls do. A lot of the demographic that is actually going to vote in the contest love them. A huge part of their rise to fame was the internet. They wouldn’t be as huge as they are now if it wasn’t for tumblr, twitter, blogs and youtube. So I think that their little fans will probably run this competition. Which is sad. There is no way they deserve to beat Backstreet Boys, but such is life. You also may be a bit annoyed with some of my other picks, but I’m just trying to take into account who I think the voters will pick. Most of the voters will identify with Big Time Rush, but they’ll have no idea who Boys II Men is. It’s kind of the same way throughout some of the other ocntests. You have to look at the voting demographic. Young girls who are crazy obsessed (like I was not so long ago) are going to spend hours on their computers voting, and their friends are all going to vote. Now, Boys II Men may in fact be the better boy band, but how many Boys II Men fans are getting on mtv.com everyday? How many times will Boys II Men tweet a link to this site and campaigning for the win, because I can guarantee the Big Time Rush will. And how many Boys II Men fans have hours upon hours to just sit and vote..? Exactly. Backstreet Boys are still around making music, and they have a pretty heavy web presence, plus their core fans are my age (and very dedicated), and know how to use a computer and are on it pretty frequently. If anybody has a shot at taking on One Direction and their crazy fans, it’s BSB. They might have a decent shot because once all of my generations other favorites get eliminated we will rally behind them. *NSYNC is a classic, when most people think boy band, they are probably what they think of, so they might have more of a fighting chance than I’m giving them credit for. 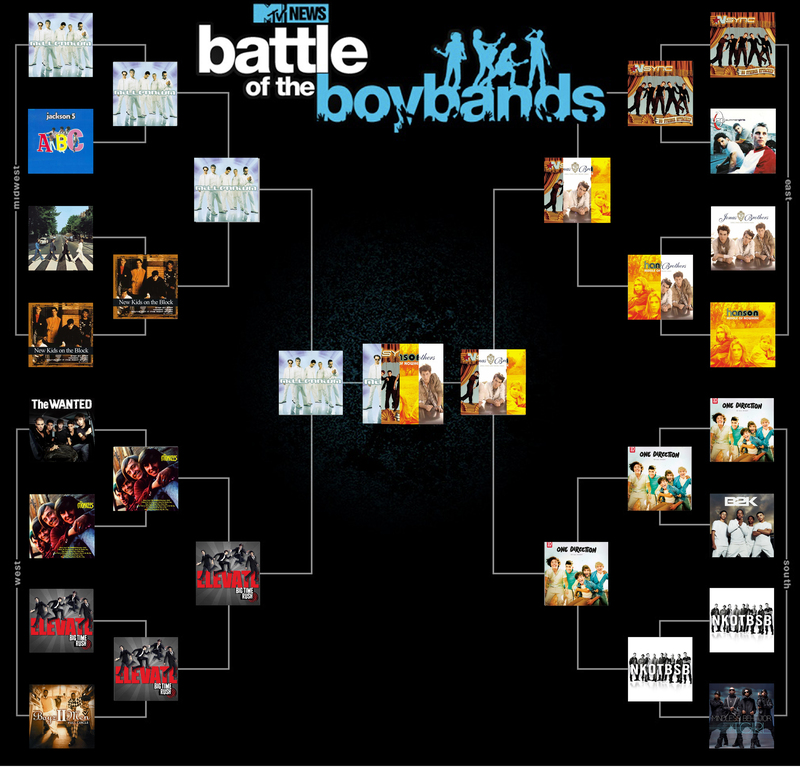 (Wouldn’t it be great if it came down to BSB vs. *NSYNC? That would be the classic battle.) And I refuse to pick a winner out of the Jonas Brothers/Hanson round. I just won’t do it. This is what I want to happen. I can’t choose! I want them all to win! That east division is just killing me. As you will notice, three of my all-time favorite bands have to face off, and if I could have my way I would want them all to win (though I don’t really consider Hanson or the JoBros as classic boy bands, but I guess they can fit in this time). You will also notice that I kept Big Time Rush ahead of Boys II Men after defending them before, but personally I was just not a big Boys II Men fan. I know that they were successful and well-loved, just not by me. I don’t really have an opinion on The Wanted, but I love The Monkees, so they win that round. Another surprising choice is New Kids on the Block over The Beatles. In my head, I just don’t categorize The Beatles as a boy band. They have more credibility than that. I mean, is Guns N’ Roses a boy band just because it’s a band made up of boys? No! So I don’t see how The Beatles fell into this catagory. I mean, if you’re going to throw them in, then where are The Beach Boys, huh? And you will also notice that I have One Direction going to the final four, but did you look at their competition? They were seriously given the easier division. I mean, B2K? They were barely a boy band. They had one song…and then I’m pretty sure they disbanded. And “Bump Bump Bump,” was hardly an innocent, boy band style song. 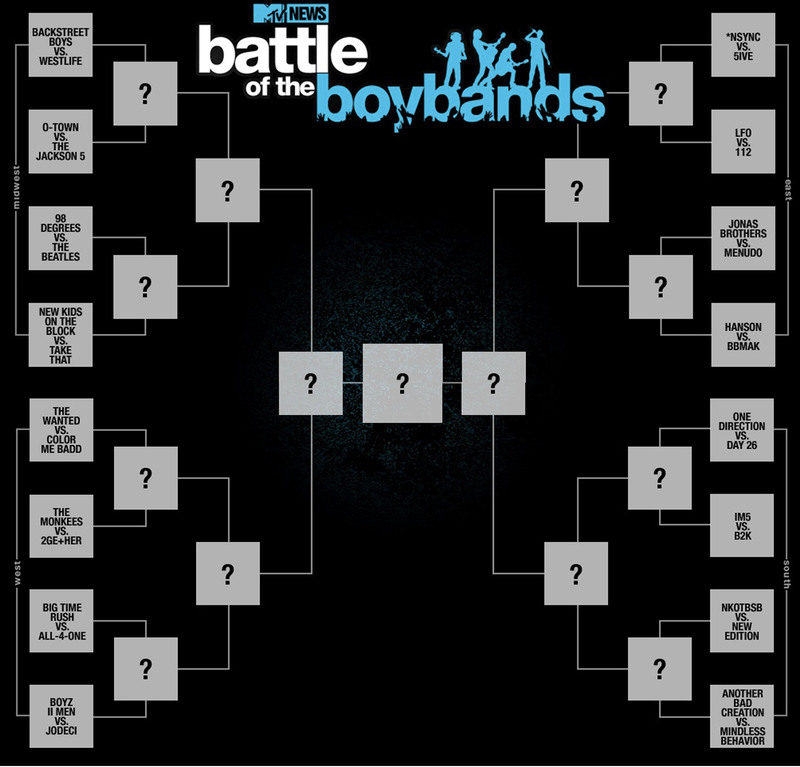 And, don’t get me wrong, I love BSB and New Kids on the Block, so therefor I love NKOTBSB and I was obsessed with their song “Don’t Turn Off The Lights,” but it seems a little bit unfair to give both bands two bids in this competition. So, if I had my way the title would be split four ways. However, if I absolutely HAD to choose…. Hanson would get my vote for best overall band…but I think I’d have to give the title of best boy band to *NSYNC. They are pretty much the epitome of the entire genre. Let me know what you guys think. Do you love boy bands? Are you glad they’re back? Who do you think will win? Who do yo want to win? Was your favorite boy band left out? Tell me what you’re thinking, I’m always up for a good boy band discussion. And be sure to vote here.